15th. Left Glasgow with night train for London, as my leave is finished. 16th. October. Thrown out at Shorncliffe, above Folkestone. Very stormy day with heavy seas running. Informed that the boat would not cross today, so took an exceedingly good lunch. After lunch we were informed that the boat would sail at 2.30 p.m. Left then, tremendous rolling and pitching. Everybody sick. I remember well standing at the rail with a general on my left hand and a major of the R.A.F. on my right, and talking to the deep with them. I felt like quoting "Death the Leveller" to them, substituting "seasickness" for "death". There was some humour in the situation. Boulogne. Put up at the Meurice and went to bed after tea. 17th. 11.30 a.m. train to Arras, tiring journey. Arrived at Q.M. stores at 7 and then went to Officers Club for dinner. Heard that the battalion had carried out a small raid. Went up to Battalion next day, and started work again as Asst-Adjutant. 20th. Bn. at Stirling Camp. Saw C.O. In future, whenever I write "C.O." here, the letters mean "Conscientious Obstructor" for that is my own and also the general opinion of Lt. Col. H.A.Duncan. 23rd. Am at Q.M. 's place in the meantime. 24th. Sat on F.G.C.M. - two simple cases with Major de Haviland. 25th. Emslie killed on patrol. 26th. Bn. came out of line. 28th. Wasted a lot of time at a G.C.M. before a court not properly constituted. Cold weather. More upheavals in the battalion. 29th. Officers all fed up and numbers wanting to leave or transfer. Battalion spirit being stamped out by C.O. 30th. Bn. moved into Left sector. Macleod came back to 'details' for a rest, and I went in as a/adjutant. Weather wet and cold. More 'Strafes'. Spent a very busy three days until night of 2nd/3rd. Nov. when we were relieved. During these three days in the line the number of letters, telegrams and reports received or sent out by me was no less than 451! I counted them! War! Eugh! 4th. - 6th. Nov. Very busy time. Had splendid row with C.O. in which he got it rather hotly from me, for all that he could say at the end was that I was not to teach him his business. If he had had any gumption he would have sent me back to my company. 12th. Up the line to see the new sector. Everything very quiet. Looked almost as though the Huns were going back. Gas cloud alarm in early morning. 14th. Moved to front line again. Left Bn. of the right Brigade sector. 15th. Busy day. Round line, working hard at O.P. Deuce of a mistake with a Power Buzzer message. Not encoded. 16th. Round line with Major G.L.Wilson, and then later again with the C.O. 17th. 'A' Coy. carried out a raid under J.L.Stewart. I was in front line at the time, watching, but our guns put up a splendid barrage, only one battery made a mistake in zero time and peppered away over our fellows' heads for four long minutes. Three men missing. Practically not a Boche seen, unless at a distance, when they were driven into our barrage. We lost three men. Remained in front line during the night. 19th. Bn. relieved. Back to Stirling Camp. 20th. Orders ready for action in event of a Hun retiral. Our offensive has opened on the South. 23rd. Had to go back for F.G.C.M. in the morning. Strafer Campbell back! What a sensation! No more news about Boche going back! Back to line at night. 24th. Busy day. Made out a report on our front line wire for Bde. who, with Division, seem to expect a Hun attack. They don't seem to know their own minds for a day. Sometimes, in the one despatch from Bde. we get "G" instructions in the event of Hun attacking and "Q" information on where dumps will be formed in the event of Hun retiring. In the end we remained steady until the end of March 1918! Did duty with 'A' Coy. at night as they were short of officers. Dirty night but very quiet. 25th. Went to 'A' Coy. again. 26th. Nov. Bn. relieved. C.O. ordered to base as physically unfit. Note from RLM, 1972: By this time, the morale of our Bn. had reached such a 'low' that in the Bn. H.Q. dugout, where only a canvas screen separated officers from men, our cook, mess waiter and servants were singing out loudly the most foul obscenities about the C.O. These choruses were known and sung throughout the whole unit. Officers and men shared the same feelings. 27th. 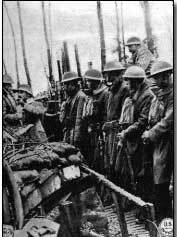 Just as we have settled down in Arras we are told to go up the line again - for what? - no one knows as orders came in at midnight. We are to take over from 61st. Div. on our left. 28th. Another F.G.C.M. C.O. to go to base as "physically unfit". Major G.L. Wilson in command meanwhile - Hurrah! What a difference! Battalion moved up in buses. What a luxury! Guides led everyone astray. Glorious view of Hun lines. This is a new piece of the Arras sector for us. Owing to the pressure in the South our brigade has taken over a whole divisional sector. It extends from South of Gavrelle to the vicinity of the Scarpe. 29th. Nov. Roaming about the line, getting to know the countryside. Saw lots of smoke in the Boche lines, coming from the coal pits which he was working. In afternoon, I took a walk with Wright, my runner - found ourselves on way up to centre Battalion. Suddenly a terrific local box barrage fell around us. M.G.s, 4.5"s and 5.9"s. At the same time he raided (4.15 p.m.) a sap held by the 6/7th. R.S.F., the battalion whose front I was visiting. Wright and myself got completely caught in this barrage - first we got driven out of a communication trench by the M.G. fire into the open. Then we got into separate shell holes. Hun put a barrage of 4.7"s in a line about 100 yards in front of us and of 5.9"s about 50 yards behind us, so that we got the 'overs' of the former, and the 'unders' of the latter around us. Then they dropped the range of their 5.9"s and both of us sprinted forward to a half-dug dugout in the midst of the 4.7" barrage. We just had to take the risk and it paid! Hun made a bad mess of the trenches! When things got quiet we went along the front line to the sap which was in a very bad way, and I went out along it to see the end. Quite a nasty mess - a large number of Boche hand grenades in it. I then found the man who had been on sentry and asked him for details. He could give none as he "had run for it" along with his friends - so he said. 30th. We got, with the necessary alterations, the true, official story of the raid in which 10 Huns had taken part. It says a lot for the energy and resource of the Huns that they should have spotted our relief one day (they couldn't help spotting it) and should have raided next day - for identification purposes of course. Busy day. Kept clear of barrages which are not intended for me. Mock Court-martial at night on Macleod. Charge was 'aggressive optimism'. Was found guilty. Great fun! 1st. December 1917. Relieved in afternoon by 8th. Seaforths. Came out early in order to get orders out. Weather breaking down but life is more comfortable than it was last year on the Somme at this time. A Boche master-stroke just South of Cambrai push. Heavy loss to the British. 2nd. to 7th. A quiet life. 8th. O.C. Advance Party to trenches opposite Roeux. In line, (front or support) until the 23rd. Acting as Intelligence Officer, but feel it is a job I am not suited for. Very busy tour. Had an amusing rencontre one day with the Divisional General, Reed, V.C. whom I took to be a 'super-American tourist officer', and to whom I spoke with some blaséness. We had a gas attack at 4 a.m. on the 19th. and had to wear our respirators for about an hour. The smell was very strong. 23rd. Relieved by 7th. Camerons and went for a Bath. 24th. Atmosphere in Arras becoming Xmas-y. 25th. Christmas Day. Rose at 8.45, feeling very pleased with life. Church. Grand morning. Heavy lunch at Officers' Club, then wrote a few letters. Colin Mitchell to be Lewis Gun Officer, and Strathie, Intelligence Officer. I'm to go on a six week signalling course. Tremendous Christmas Dinner at H.Q. We killed several fatted calves. Adjourned to 'B' Coy. where we found the rest of the battalion in grand form (some in too good form!). Rather a jovial time. Bed 1 a.m.
26th. Dec. Plenty of snow. 27 - 31st. Routine work out of the line to keep one busy. 31st. We move to Simencourt tomorrow, taking over from 3rd. Grenadiers. The Guards Officers are very snobbish. They will scarcely reply to an infantry officer's "Good morning" when they meet. Very nice quiet dinner at night. Tobermory Maclean as guest. Round to 'A' Coy. at 12.30 a.m. J.L.Stewart keeping things lively there. Left at 2 a.m.
Major James Mitchell, D.S.O., late of 13th. Royal Scots (in same Bde.) is now in command of the Battalion. He was an original 'sub' of ours, and is tremendously popular, and is acting as a general tonic. We feel it is a pleasure to work for such a man. His efficiency, his sense of duty, combined with common sense and his good humour are making us a new lot of men - for the late C.O. 's presence undoubtedly lowered our spirits. 1st. January. Battalion moved back in the afternoon to Simencourt. Roads iced and very slippy. Passed the Guards' transport column en route. Have never seen any transport in such a filthy condition. We took over billets and huts from the Guards Division. Their discipline must have been knocked out of them by the Cambrai show for their huts were in a shocking state - in many cases the planking of the roofs had been taken off and used as firewood. In some the walls had been similarly treated, and the huts were consequently useless. 2nd. - 4th. Training resumed. When will we be able to consider ourselves 'trained'? 5th. Colonel Mitchell had all the officers out this morning. He took us over a lot of ground, pumped us with questions and shook us up splendidly. G.O.C. lectured to us at night, and then came to Bn. H.Q. for dinner. Frost still keen. Things really going well. 6th. Up early - 6.30 a.m. and got stuff packed for transport. Walked over to Haute-Avesnes to XVII Corps School, where I am to take a course in signalling - my first course since coming to France sixteen months ago - a rather long period for a sub. to go without a course. Glorious winter day. Photo taken at Habarq. Got settled down in a somewhat cold looking hut. 7th. Test exams for entrance. Made P.M.C. being the only Scotch Officer in the signalling line. Am in with a lot of gunners and English officers. Met Mather Campbell of Hillhead School on the course. He was in the Seaforths. Last time I saw him was at H.H.S. in 1909, when he threatened to punch my nose, and I his. And both being somewhat prudent and probably a little frightened of each other we decided to call the fight off until a more convenient season! (Note from RLM, 1972: I don't remember him) And now I meet him in this 'Crystal Palace' of a camp in France! Poor Campbell was killed very soon after the school broke up. 8th. - 12th. Cold weather. I am not enthusing over the work. 12th. Along with Burgess I walked over to Donald Simpson's grave at Aubigny. 13th. Meant to go to church, but couldn't find it, so had a fine lazy day instead. Read Browning. 15th. Pay raised by 3/- per day. 19th. Rode to Arras. Am having too easy a time - tends to be boring. 22nd. Guest night at the School. Quite a good orchestra. Great scenes after dinner. One of the last scenes before breaking up was the Colonel of the School with the G.O.C. Corps "Hooching" in an eight-some reel! 25th. January. BURN'S NIGHT! The Sassenachs who run this show organised a dinner, ostensibly in honour of the Bard, but really for one magnificent 'blind'. C.O. and all the staff of the school plus guests (from the corps - Archie Whyte of Hillhead H.S. was among them) were all present and music was provided by the Household Battalion. Quite a good dinner. Band and pipers not very successful as the former knew no Scotch music and the latter only played laments and slow marches. Proceedings ended noisily at 11 p.m.
26th. Rode to Arras with Burgess. 27th. Indifferent sermon on the miracles from a padre who had lost all his breath cycling up the hill to Haute-Avesnes. 29th. Finished the Browning Letters - one of the biggest feats of the war! It has taken a tremendous effort of will on my part to get through them. Felt that if I had been in love I could have written better letters than those!! 31st. Jan. Hockey with the NCOs. Feb. 2nd. Another exam. Didn't shine in it. Went over to Aubigny to see about a cross for Donald Simpson's grave. 3rd. Breakfast in bed. Some luxury! 5th. Saw most exciting smash of an aeroplane against the buildings and tents of the 13th. Squadron R.F.C. Machine turned turtle and nose dived. Pilot unhurt. Am doing a fair amount of reading. Enjoying "Ann Veronica" by H.G.Wells. 6th. Over to Arras for bath. Heard that the battalion was just moving into the line from Wilderness Camp. So I haven't missed any trench tour during my absence at this signalling course. Am somewhat disgusted with the way this signalling course is run. The chief instructor is a weak-kneed pliable individual who can be wangled into anything. To Aubigny on 9th. Cross for Donald Simpson's grave finished. 12th. Capt. Liddle the instructor, informed me that the C.O. of the Signalling School had applied to Corps H.Q. to have an extra officer instructor sent to the school and that he had asked for me. I told Liddle to get the thing withdrawn at once. He told me it was too late, so I wrote strongly to the battalion to get them to stop the business. I don't want such a job as this. The chief instructor is a sufficient nonentity himself, and there is no excuse for an assistant nonentity to him. Guest night at the School. Breezy. 13th. Lecture by G.O.C. Corps. - Sir Charles Ferguson. Quite good and well delivered. Infantry school broke up. 15th. Exams. all day. Did fairly well. Had average of 99 1/2% in all my messages and reading. Guest night. Liddle and an American doctor to dinner. Made short speech. Saturday 16th. Told to remain on at the School. Went up to the battalion which I found in the support trenches. Saw C.O. who was angry at the School trying to keep me - but he refused my application for leave! Visited 'B' Coy. Dinner at Details with Major Wilson. Gib. Mitchell back. Walked back to Haute-Avesnes at midnight. Sunday 17th. Am pretty sure I will get back to the Battalion soon. Went to St. Pol, had lunch, bought some books. Stopped a staff car, and got back to Aubigny for tea. Shifted into a fine comfortable hut with a fire. Finished "Mr Ingleside". Monday 18th. Arras for a bath. No word yet. 19th. Feb. Word to rejoin the Battalion. Hurrah! Back at 6 p.m. and slept the night at Details. 20th. Played about with a rugger ball. 22nd. Bn. came out of the line to Wilderness Camp. Sunday 24th. Church. Rugger afterwards. Football match between 'A' and 'B' Coys. Latter won by a corner. Jock Stewart of 'A' lost 100 francs on the game. Monday 25th. Up to see 6th. Camerons. 26th. Relieved 6th. Camerons in support. Fine night. Moved across the open. 27th. Off again. Round line in morning. Hun crumping our batteries with 8 inch. Macleod back from leave. Told I could go on leave. Hurrah! Dinner at Details. Wet night. Train at 11 p.m.
Thursday 28th. Feb. Reached Boulogne at 7 a.m. Boat at 10 a.m. Rough crossing but fortunately not sick. Tea at the 'Troc' with Stannard. Left for Glasgow at 8.50 p.m. and got home next morning at 8.50 a.m. On the go at 10 a.m. Round the town. Then the fun began! Wednesday 13th. March. Leave finished - Damn! My morale is very high, however! Reached London 11 p.m. Slept at Belgrave Mansions Hotel. Thursday 14th. Train 7.30 Victoria. Did not, of course, see the Leave Party of which I was nominally in charge! Didn't worry either. Left England 1.30 p.m. Got to France at 3.30 p.m. Not sick fortunately. Tea at Officers' Club, Boulogne. Dinner at Meurice, where I stayed. Friday 16th. Grand Day. On move again. Arrived Arras 5.30 p.m. Back to the old life. Bn. just coming out of the line. Place quiet, but evidence of 'wind up' everywhere. Dined with Bradshaw. Slept at "Chateau Strafer". 16th. Blew up to Bn. Found all well. Big two company raid in preparation. Hope young M. won't be in it. Would like to go myself! (Note from RLM, 1972: Honest?) Heard that as I was the only subaltern who had been 12 months continuously with the battalion I may get home for six months rest. At any rate my name had to be submitted for it, but with the recommendation that I do not go. Don't know whether I will go or not. Don't know whether I'd like to go or not! Appalling 'wind up' all along tour front on account of possibility of Hun attacking. Quiet night, of course! Sunday 17th. March. Rose at 5 a.m. as 'stand-to' representative at H.Q. Artillery very noisy. Bed again at 5.45 a.m. Church. Glorious day. More preparations for the raid. Young M. is in it. Wish I could get in. May manage it, somehow, if I go over on the sly. Football in afternoon - very enjoyable. 18th. March, 1918. Out with the signallers. Played soccer against the corporals of the battalion. A good game. Dined in Arras with some of 'B' Coy. officers. Back by 11.30 p.m.
Tuesday 19th. Took over H.Q. for Support Battalion. Front coys in shell holes, and very uncomfortable. Fairly quiet night. 20th. 'Stand to' at 5 a.m. Round line in morning. Very wet. Fine afternoon however. Bn. H.Q. shifted to Feuchy Chapel Cross Roads. Thursday 21st. March 1918. Wakened at 5 a.m. by terrific bombardment. Shells of all calibres coming over us in hundreds, many of them gas shells. All our wires to companies broken early on. Two signallers out repairing them, returned 7 a.m. were no sooner back than the wires were broken again. Went out with the signallers Stirton and Stark. Had a very thin time. We stood right in the middle of a barrage of gas shells from one battery, wearing respirators and mending the wires. Sometimes the shells came within 8 yards. This continued for 1/4 hour. Seemed like centuries to me. I would have run like billy-oh to get out of it, if I had not had these two signallers with me. They didn't seem to care, either. The line went disc. as soon as we got back. Two more men out with little effect. After breakfast, as the bombardment still continued heavily, I rummaged for wire, and by using small pieces, I got on to a buried cable where I got three companies. Visited 'B' and 'C' companies. Did work party in afternoon for latter company. Glorious afternoon. Thank the Lord I always have time to note the weather. Sun warm. Shelling now not so bad. On this day, the Hun attacked to the South of Arras and along the Somme district, and made tremendous progress. Village after village was taken, and our 5th. Army received a terrible hammering. Tuesday 22nd. Pretty busy day. Our quarry at the cross roads, Feuchy, strafed heavily. Good weather, but muddy. Saturday 23rd. March. Ordered to withdraw from Monchy, withdrawal to 3rd. system to be completed by 3 a.m. Reconnoitered 3rd. system (in front of Feuchy Chapel cross roads) and got companies in by 2 a.m. We thus became front line battalion - a very fortunate circumstance, as we were to discover later. Saturday 24th. March. Boche attacked Monchy to find it completely empty, except for a company of Camerons who were rear-guard, and did little other than guard themselves. The two men in Monchy (Camerons) who looked after the gum boot store were taken prisoner. Jimmy Flind did a very good show coming back slowly and keeping his Lewis gun busy. We 'stood to' early. Felt a little tired. Watched Boche come over the ridge. Fosse Farm evacuated. Some amusing scenes there, as the occupants did not know about the withdrawal there was some difficulty in persuading them about it. An R.E. officer there was awakened from sleep in his pyjamas! We were in contact with the Boche all along our front line at midday, and there was plenty of sniping. 'A' and 'C' Coys. in front line. No shelters practically, but fine deep trenches - too deep in fact, in places. Few shells. Men fed up at leaving Monchy. Got signals going fairly well. Later on, the Boche bombarded us fairly heavily, and we had a few casualties. Monday 25th. Boche had been busy all night, although we had patrols out. He had got his big trench mortars up and was using them prettily. Stewart had a very narrow escape from one. Round line as usual. Shelling more intense, and bursts more frequent. The whole atmosphere more tense. Our rear areas got well shelled. Our Bn. H.Q. was in a large pill-box beside Feuchy Chapel Cross Roads. They were large and cold, but pretty safe, being old Boche ones. I visited the Seaforths on our right several times. Note from RLM, 1972: Then follows an entry in my diary under the day of Monday 25th, which seems a repetition of the incident of wire mending under gas shell fire of the previous page, except that I mention Serjeant Mitchell's name in addition and also say we clipped our respirators over our noses but without putting the helmets on our heads. My memory now does not help me to be clear on the number of incidents. 26th. March. Busy day. Relieved late at night by 13th. Royal Scots who came into front line. Camerons went back to support, and we to reserve - about 2 a.m. on 27th. - in the Army Line in front of Tilloy-les-Moufflaines. Rotten H.Q. in most difficult place. Easy to spot from the air but difficult on the ground. Got signals going again. Round line again. Kept busy, and so got very tired and sleepy. March 28th. Thursday. Wakened up after two hours sleep at 3 a.m. by deuce of a bombardment. The very earth seemed to tremble, just as at Ypres last year. Gas shells in hundreds came over, and the back areas got a big share. In the darkness we could do nothing, but wait on the dawn. All our lines, both forward and back, became broken. Bombardment of our lines kept up by Boche for three hours. Those poor devils of runners - who, I think, are without doubt and with no exceptions the finest and bravest men in the services - had a bad time, for they were called upon for tremendous exertions. About 6 a.m. the bombardment became even more intense, and we all stood to, for dawn. Meanwhile Boche attacked our front lines. Things were very nasty with shelling for an hour. It became rather unpleasant moving about. The C.O., Colonel Mitchell, buzzing about everywhere without worrying, was wounded about 7 a.m. and Captain Wilson therefore took command. He was very soon blown up and had a lucky escape from death. Macleod therefore became C.O. now. Bombardment did not become any easier. I went along to see the Seaforths once or twice, and knocked around generally. The Boche at this time did not come into contact with our Bn. as we were in reserve. All our casualties were from artillery fire, and a few from M.G.s. The Camerons and Scots in front fell back a bit in some disorder, the latter having a poor time of it. Their front lines had had a tremendous strafing in the morning from heavy trench mortars and gunfire. The Boche attack was admirably conceived and executed. He used a lot of 106 Fuse - i.e. instantaneous burst. From what we saw in these two days or so his men, either as individuals or as a body, were most excellent soldiers. They seemed to be able to think for themselves in attack. Kelly of the Royal Scots did very fine work, but the Camerons simply broke and ran. (Note from RLM, 1972: I don't blame them.) Their H.Q. came down beside us. I managed to do good business, however, as I got one of their Lewis guns which they had cast aside, and a telephone, and added them to the Battalion store. We have about 4 Lewis guns now in addition to our normal establishment, and also a number of extra phones! There was a lot of confusion all morning as the Boche bombardment was perfect. He burst everything and we never knew where his shots would land next. Everywhere our wires were burst. Our 'D' Coy. on the left, had a bad time, about 40 casualties. Their skipper did well - Billy Irvine - his men afterwards recommended him for his gallantry. Our left flank was very weak and exposed, and I went along to have a look. Our fellows occupied their whole frontage to the Arras-Cambrai Road, which was exclusive to us. The Scottish Rifles should have been astride that road, but I had to go fully a quarter of a mile before I found them. Watched one of their companies leave for a counter-attack - poor devils. I felt glad that I wasn't in that little episode. I found the Rifle's C.O. Stanley Clarke, pointed out the gap between our battalions and asked him to occupy his ground (Cheek!) as we wanted to keep in touch with him. All very interesting work. He was not much perturbed. I walked back slowly in order to see them start but the blighters went about so much in the open that they brought the Boche guns down upon them, so I shifted my position a little! We had 4 officer casualties - the C.O., Col. Jim Mitchell (wounded, died later), Capt. Wilson (Emma) a splendid fellow, Stewart and Christie, all wounded. Of the men, there were 80 casualties, including about a dozen killed. We got a number of cyclist R.E.s up at night to support us. They were a bit amusing. There were no reserves on our part of the front, behind us - except the Divisional General and his staff. I heard they were even roping in the Divisional Dustman from Arras! The 44th. Bde. had a bad time. The 7th. Camerons had only 34 men left, so I heard, so our luck was in compared with that. The Boche got up to Bois de Boeufs, about 100 yards or more from our front line. Christie (who became a Church of Scotland Minister) ran a very good show. He went out, either alone or with a man, picked off every member of a Boche M.G. team, then got up, walked over to the gun, lifted it on his shoulders and came back with it. Very good it was, but the poor fellow got a very nasty head wound at night, from which he recovered very slowly later. This show of his was just alongside Bois de Boeufs. Major G.L.Wilson came up at night to take over command, and we re-organised a bit, doing a bit of side slipping. 29th. 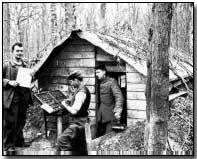 We formed a thin chain of outposts along the Eastern edge of Bois de Boeufs. Very interesting work it was. Things were quietening down now, and I think Boche had shifted his reserves or else thought that we were holding the Arras front too strongly. At the same time, his great attack was going on in the South, on the 5th. Army, and he was driving our fellows back every day. We, in the 3rd. Army, were just on the edge of this area, and the Boche movement pivoted on Arras. Hence as long as Arras was held he could not extend to the north since Vimy is easy to hold from the front, but difficult to hold from the Scarpe Valley direction. So I suppose the 15th. Division paid its way again at Arras! 31st. Also in line. It is all quite interesting to look back upon. The C.O. Major Wilson, is in good form. We had as usual to move fairly slickly once or twice on account of shells, but Fritz was, on the whole, very quiet. It seems to me that though his attack was perfect in its organisation and execution, Boche had gone wrong on one or two points (1) They had underestimated the strength of our resistance (2) They had overestimated the numbers of our reserves - we had no reserves. All three brigades were in line. There was nothing to support these three brigades except an odd cyclist battalion. If Boche had known that fact I'm sure he would have pushed until we were broken. As it was he merely pushed us back about 1 1/2 miles, but did not break up our formation, or break through.